Laura Florand is one of those exceedingly reliable authors who always manages to write a book that I know I will adore. I’ve only read three of hers thus far (I’m rationing them), but each one has been utterly charming and full of amazing culinary inspiration. The Chocolate Kiss is no exception. 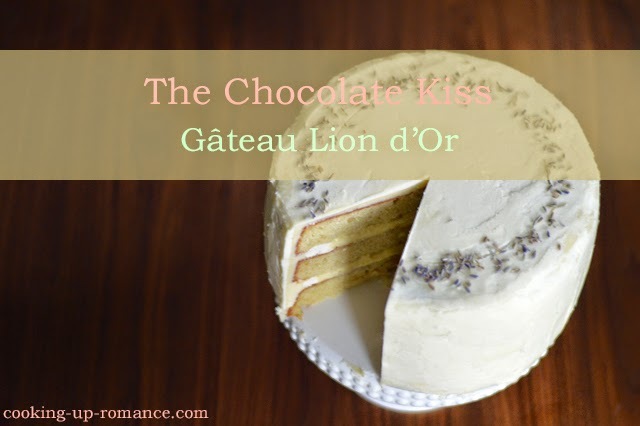 It takes place in the Paris of The Chocolate Thief and we get a few glimpses of the happy couple, Sylvain and Cade, in this book. However, The Chocolate Kiss brings us out to the Île Saint-Louis, a small neighborhood of Paris. Magalie Chaudron (aka my book BFF) lives and works there in her aunts’ tea-shop: La Maison des Sorcières. After a childhood spent being shipped between her mother in Provence and her father in upstate New York, Magalie has never felt at home anywhere. But she thinks that she just might learn to belong here, until the entire existence of La Maison des Sorcières is threatened by the prospect of the hottest pastry chef in Paris opening a new shop on the Île Saint-Louis. Philippe Lyonnais is Paris royalty. Not only does he come from a generations-long line of exceptional pastry chefs, he is charming, gorgeous and in every way larger than life. He is so far above mere mortals that when Magalie demands that he steer clear of the Île Saint-Louis for his new shop, he tells her that he doesn’t consider La Maison des Sorcières competition. This enrages Magalie and kicks off a battle of business, wit and temptation-by-treat that slowly ratchets up the tension in this story, both sexual and otherwise. Every time Magalie and Philippe appear on page together, I found myself holding my breath. Their banter is top-notch as they trade insults designed to wound. This is particularly tough on Philippe, who realizes much earlier than Magalie that the friction in their relationship isn’t just one of business rivals. But his pride and her defensiveness keep getting in the way. And the way they treat each other’s baked goods! I swear, I was more relieved when Magalie tried one of Philippe’s macarons than I was when they finally tumbled into bed. The secondary characters of Aunt Geneviève and Aunt Aja, as well as Philippe’s employees and the customers of the tea-shop are also exceedingly well-drawn. They form the basis for the little community surrounding the two lovers, providing outlets for their talents, encouragement when they’re acting particularly pig-headed or despondent and giving this magical book its sense of place. I adored The Chocolate Kiss. Magalie is my favorite heroine ever and Philippe is beyond dreamy. The heat the two of them generate together and the cast of colorful supporting characters will keep me returning to this book year after year. If you haven’t read it, or anything else by Florand for that matter, run off to wherever you get your books and rectify that immediately. Let’s start with the important stuff. I totally made up the name of this cake so don’t bother Googling it. It doesn’t exist. Yet. Except when I’m a world-famous Parisian pastry chef I will *make* it famous. That’s a joke. I’m not that ambitious. 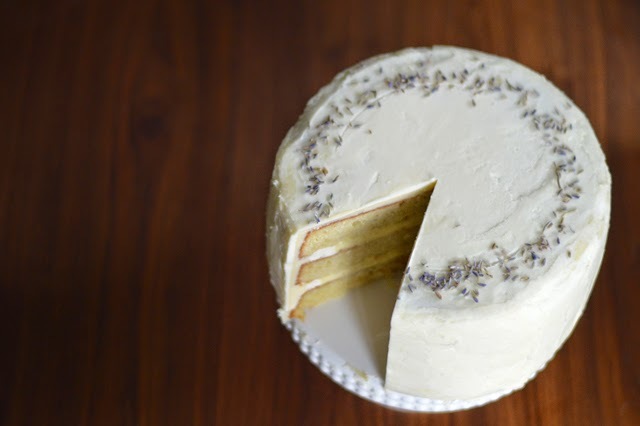 Actually, what happened is that I went to type “Lemon Almond Cake with Lavender Pastry Cream Filling and Honey Swiss Meringue Buttercream” into the title line and it looked a little long. So I made up the name and asked Kay (aka Miss Bates) of Miss Bates Reads Romance to help me translate it into French. When you read the book, you’ll get the reference. Any errors in French are, of course, mine. I wouldn’t exactly call this cake a beginner project, mainly as a result of the Swiss Meringue Buttercream (henceforth SMB) frosting. Maybe an intermediate project? It took me two or three tries to get SMB right back in the day (I’m a self-taught baker). Finally I stumbled upon this tutorial, which shows the two main things that can go wrong with SMB, namely the “curdled” stage and the “too liquidy” stage. My problem had always been the curdled stage, which resembles cottage cheese. I assumed I had done something wrong when it hit that point. As it turns out, it’s totally normal. Just keep whipping. Then you have to frost a three-layer cake. My biggest tip? Lots of refrigerator time. Refrigerate the cake layers before you cut the domes off, refrigerate the layers once they get their custard dam (you’ll see), refrigerate after the crumb coat and refrigerate after the final frosting layer. It’s time-consuming but worth it because the layers won’t slide all over in the refrigerator and the pastry cream won’t squeeze out the sides when you cut it. Oh, and you’ll notice the absence of chocolate in this cake. The macaron that Philippe makes for Magalie has lavender, honey and chocolate. I’m not the genius baker Philippe is and I couldn’t figure out a way to keep the chocolate from overpowering the subtle lavender and honey flavors in a cake so I gave up and used lemon. Call it artistic license. 1. In a medium saucepan, over low heat, heat the half & half, 6 tablespoons of the sugar, lavender, vanilla scrapings, vanilla pod, and salt and allow the lavender to infuse for 30 minutes. Increase heat to medium-high and bring to a simmer, stirring occasionally. 2. As the half & half mixture begins to simmer, in a separate bowl, whisk the eggs yolks, cornstarch and remaining 2 tablespoons sugar together until smooth. 3. Strain the half & half mixture through a fine sieve into a heat-proof measuring cup, removing the lavender and vanilla pod. Slowly whisk about 1 cup of the simmering half & half mixture into the the yolks to temper. Then slowly whisk the tempered yolks back into the simmering half & half mixture and reduce heat to medium. Whisking constantly, return the mixture to a simmer and cook until thickened and a few bubbles burst on the surface, about 30 seconds. Off the heat, whisk in the butter. Lay a sheet of plastic wrap flush to the surface of the pastry cream to prevent a skin from forming and refrigerate until cold, about 3 hours. 1. Preheat oven to 325 degrees. Butter and flour 3 8″ cake pans lined with parchment rounds. Place 3/4 cup sugar and almonds or almond flour in a food processor and process until finely ground. 2. In a stand mixer, cream olive oil, butter and remaining 2 1/4 cups sugar; beat in almond mixture until combined. Add eggs, one at a time, beating well after each addition. Beat in vanilla. 3. In a small bowl, combine lemon zest, sour cream and half & half. In another bowl, combine flour, baking soda and salt. 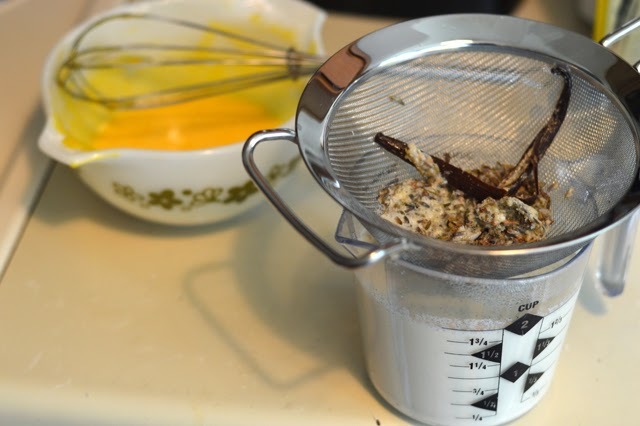 Alternately add sour cream mixture and flour mixture to butter mixture, beating well after each addition. 4. Pour into prepared pans. Bake for 28-32 minutes or until a toothpick inserted near the center comes out clean. Cool for 10 minutes before removing from pan to a wire rack to cool completely. 1. In a saucepan or double boiler, heat 1″ of water over medium heat. 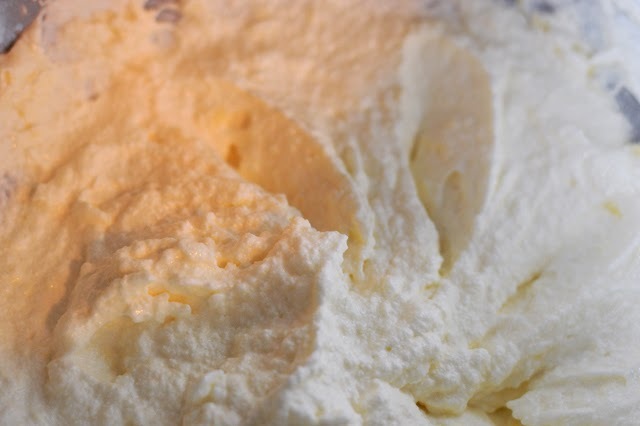 In a metal mixing bowl or the bowl of your stand mixer, combine egg white and sugar with a whisk. Make sure the top of the water doesn’t touch the bottom of your pan. Whisking constantly, heat until the sugar is completely dissolved and eggs are quite hot. With experience, you’ll be able to smell when it’s ready, but if this is your first time, use a candy thermometer and remove from heat when it hits 160 degrees. 2. 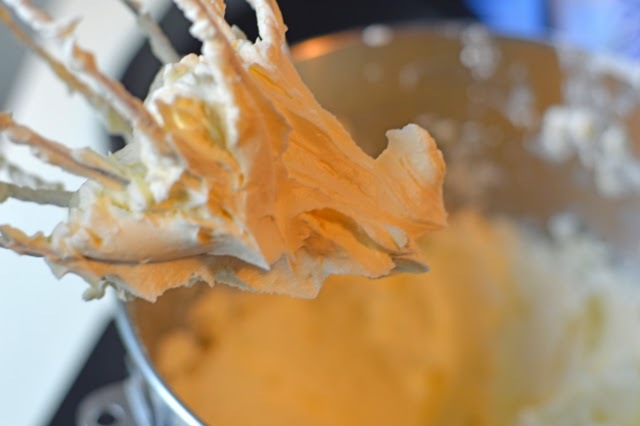 Using the whisk attachment on your stand mixer, whip egg white mixture on high for 10-15 until firm peaks form. By this time, the eggs whites should have returned to room temperature. If not, keep whipping on medium until they are at room temperature. 3. Add butter slices one at a time, whipping at medium speed until fully incorporated. There may be a stage midway through adding the butter when the entire mess looks curdled and inedible. If that happens, just keep whipping. It really will come back together. When all butter slices have been added and it’s pretty much frosting consistency, add the honey, turn up speed to high and whip for 3-5 minutes. If the mixture is liquidy at this point, refrigerate until it firms up and rewhip before using. 1. 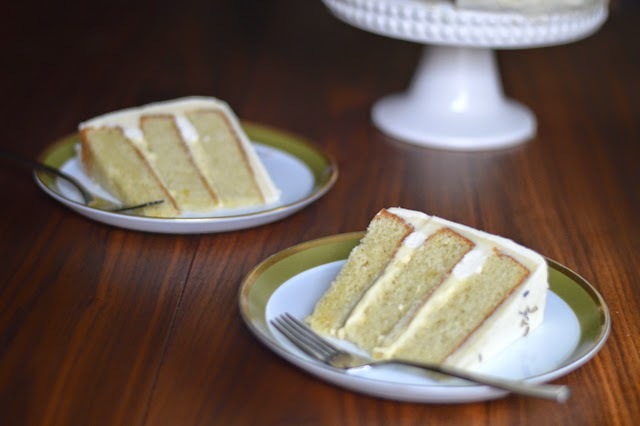 Once cooled, refrigerate tightly wrapped cake layers for 30 minutes. Remove from fridge and slice off the domes, reserving for cake pops, rum balls or hungry husbands who just got off airplanes. 2. 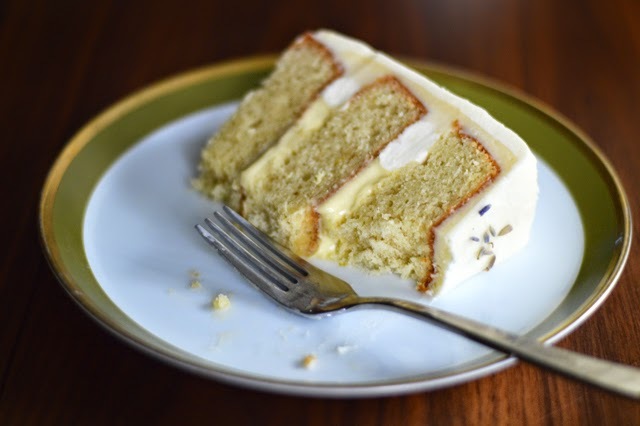 On your decorating stand or cake plate, place a small dollop of frosting on the plate to keep the first layer from sliding around while you decorate. Place the first layer on the plate. On another plate without frosting, place the second layer. 3. Using a pastry bag fitted with a 1/2″ piping tip, pipe around the cake, getting as close to the edge as you can. Repeat with the second layer. 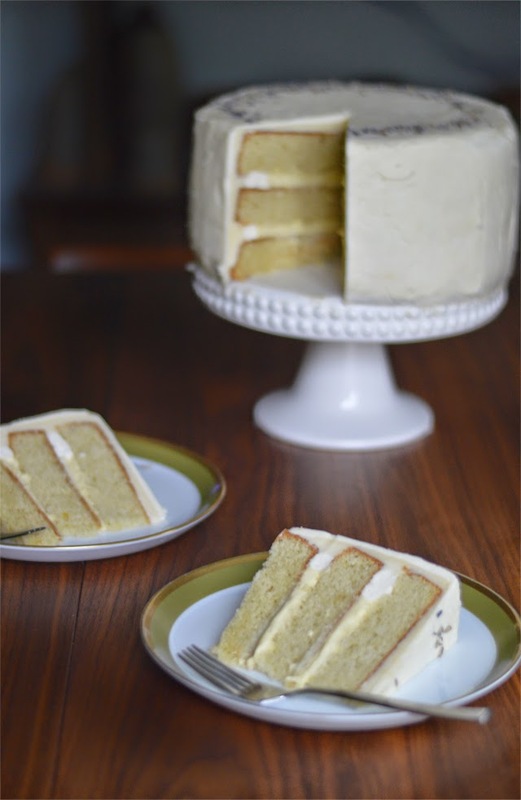 Refrigerate both layers for 15-20 minutes or until frosting is firm to the touch. 4. Place a generous 1/2 cup of pastry cream on the first layer (the one on your cake plate). 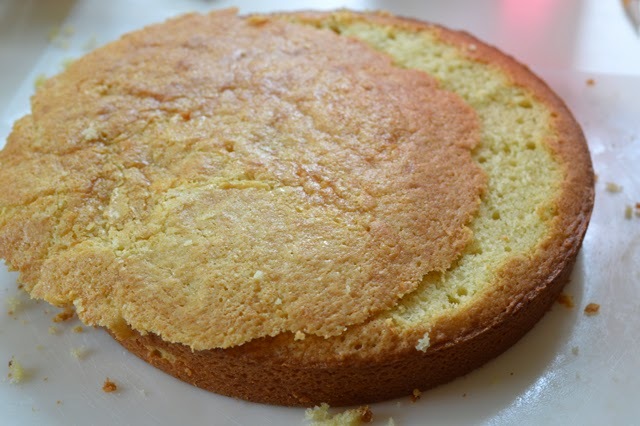 Using a spoon or the bottom of your measuring cup, even it out over the surface of the cake. Place the second layer on top of the first layer and repeat with another generous 1/2 cup of pastry cream. You may have a tiny bit left over, but resist the urge to overfill the cake–definitely don’t exceed the capacity of your custard dam. Place the third layer on top of the second layer. 5. 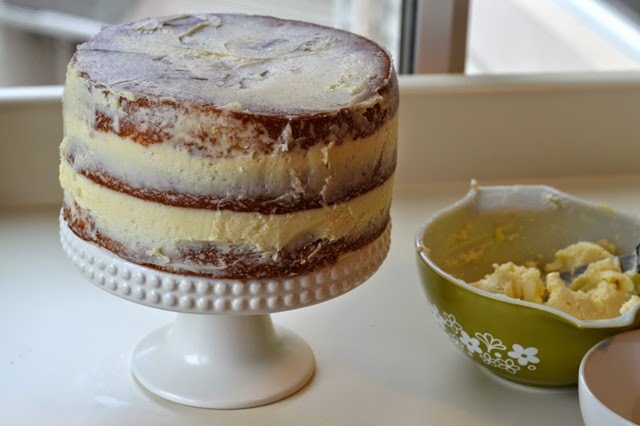 Using approximately 1 cup of frosting, coat the cake with a very thin layer of frosting, filling in the sides where there are gaps and creating an overall smooth base for the final frosting layer. If you wipe off excess frosting, do not return it to the original frosting bowl to avoid getting crumbs in your final coat. Refrigerate for 15-20 minutes. 6. Using most of the remaining frosting and a 10″ offset metal spatula, complete your final frosting layer. You may not use all the frosting. Keep remainder in an airtight container for up to one week and use to fill macarons. 7. 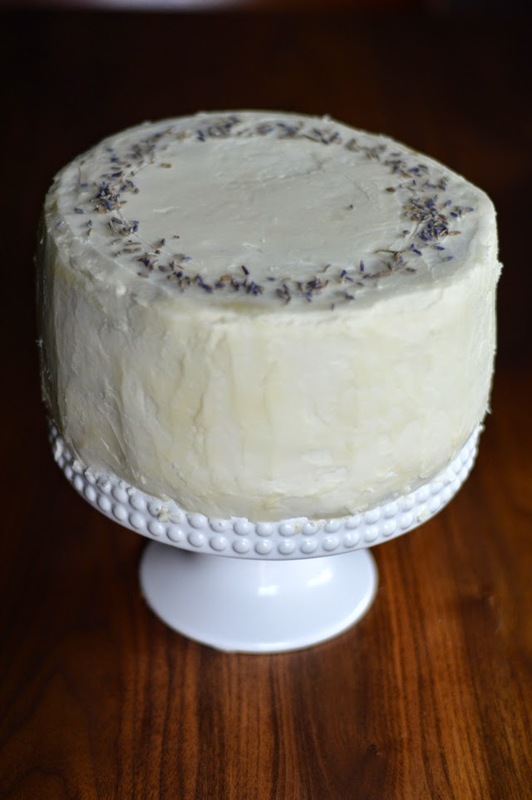 If desired, sprinkle extra lavender in a circle on the top of the cake for decoration. * For the record, I had to make two batches of frosting, which is why my cake is a little discolored-looking. I fixed this in the final recipe so your frostings will be the same color throughout. Just an interesting lesson in how different butter colorings can be. Now that I’ve done it successfully a bunch of times, it’s pretty easy, but I was so frustrated with Swiss Meringue Buttercream at first. Like Magalie trying to make macarons. You’ll also notice here that I didn’t attempt macarons. 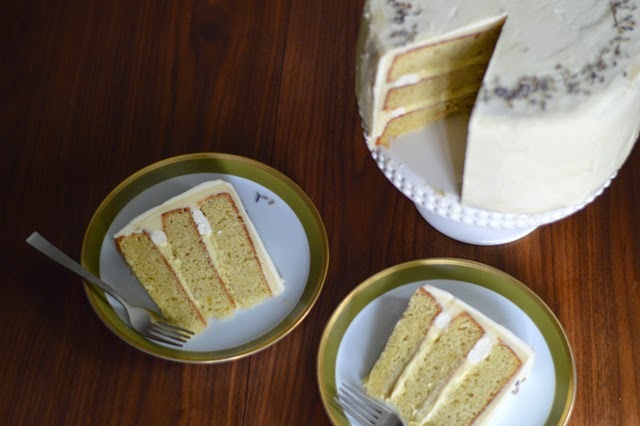 So have you made Swiss Meringue Buttercream frosting? Or perfect macarons?